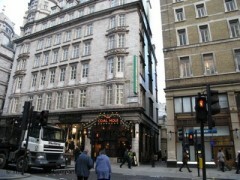 About: The Coal Hole is situated close to the Savoy Hotel. It serves good beer and provides a friendly service. There is a bar downstairs which is available for private parties. Seating on the terrace area is available, weather permitting. Went here again last week and enjoyed a few beers on the pavement in the lovely weather. It's great to be able to have a pint whilst watching busy Londoners rushing about their daily business. Great pub, when in this part of town I'll always head for this pub for a quick pint. Good pub, it has a nice small pub atmosphere which makes a refreshing change to all of the trendy bars.